This town's full of big names, and walking legends. The golden and the chosen. But when you rise up that high, you cast deep shadows. That was where guys like me lived. Skulking in the alleys, watching doorways to see who came and went with their hoods up and an eye on their back trail. I found people who didn't want to be found, and ferreted out secrets people would rather keep hidden away. It didn't pay much, but it wasn't usually as dangerous as breaking open lost tombs, or starting trouble with dragons. Usually being the key word. I was leaning up against a post outside a cathouse, trying to look like a drunk minding his own business, when a fist came out of nowhere. Old instincts kicked in, but not soon enough to duck the punch entirely. I hitched up against the grimy bricks, my head ringing like a fight bell. I shook the echoes out of my ears, and saw two burly bully boys facing me. One gave me a smile, flashing a hint of a tusk with a gold cap on it. "Stay away from this corner, old man," the half-breed said. "Folks round here don't like pokers. You hearing what I'm saying?" I fished a flask off my hip, and took a nip. My tongue tingled, and the elixir started doing its work. I gave the bruiser another look over, and ran my tongue over my teeth. They were all still in place. I straightened up slowly, and pulled my collar straight. Then I drove my fist up hard under his jaw, right in the sensitive spot where the bone met muscle. His mouth clacked shut, and I heard teeth splinter as he fell back into the post. I thumbed my nose, and spit blood from my split lip into the gutter. I rolled my shoulders, and brought my fists up. "Sorry, I don't listen all that good," I said. "Care to say it again?" "If you can get it out, that is." A big part of this particular concept is in how you roleplay it, and in the story you're trying to tell. Heroes in noir stories tend to be hard-edged, hard-boiled, and unshakable. They've led hard-knock lives, and they usually have a black mark or two on their history. They're smarter than they look, they're good at their work, and no matter how hard you try to scare them off they always come back with just one more question. And while you can make all kinds of classes into noir heroes, in this case, we're focusing on the Investigator. You get access to alchemy, you can disable traps, and there are archetypes that even give you access to firearms if you want to pull your gat and stick it in a mug's face when he tries to jump you. You could even throw in a mix of other classes, like brawler for combat prowess, or the thug archetype for rogue to show that you know how to make a threat stick. Whether you mix or go straight, though, you've got enough skill points to sneak around, make some threats, and wheedle a favor or two from people who can help you unravel a mystery. 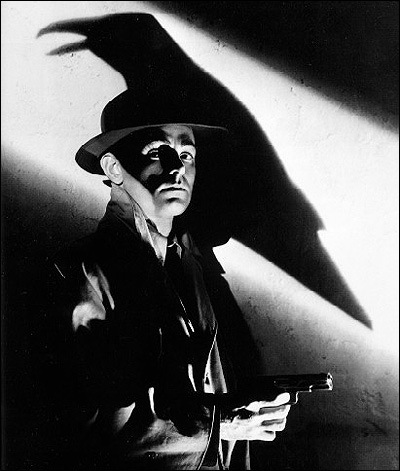 Perhaps the most common feature of noir detectives is that they used to be part of a violent profession of one stripe or another. If you were a prize fighter who just didn't have the skill to make big purses, and your nose got broken one too many times to keep getting in the ring, then the trait Heavy Hitter might be appropriate, giving you a +1 trait to unarmed strike damage. If you used to be a cop, or a soldier, then you could take a trait like Eyes and Ears of The City to get a +1 to Perception while making it a class skill, or you could take something like Reactionary to get a +2 trait bonus on Initiative checks to show that you're always operating on high-alert. It's not just that you are used to rough work, though. Noir heroes also tend to be damaged goods in some way, shape or form. That very damage might be the reason they find themselves following philandering husbands, and scaring off stalkers. If they used to be a fighter, maybe they couldn't leave the violence back in the right, and it started scaring off friends and loved ones, breaking trusts in ways they couldn't repair. If they used to be a soldier, or a guardsman, they might have started drinking to cope with the things they'd seen and done. When the drinking got out of hand, though, they were discharged. Or maybe they were used to getting results with a heavy hand, but when they broke a drunk's collarbone, the boy turned out to be the son of a judge instead of just another loudmouth, and suddenly you found yourself with skills, but nowhere to employ them. And, in some circumstances, your preferred methods of getting results simply weren't acceptable as a member of an official force. As a private operative, though, people are more than willing to look the other way as long as you don't get caught. So ask who you used to be, and if that reputation still follows you around. And was that reputation better, or worse, than the person you've become? The Small Legend: Character Reputation in RPGs talks a lot about this as a potential tool for making your PC known to others you end up working with. Then ask what you did, or what happened to you, that brought you low. Was it pushing too hard on a case where you were sure they arrested the wrong guy, but the powers-that-be cut you off rather than listen to the truth? Did your vices get out of control? Were you betrayed by the organization you worked for, whether it was secular or religious, leaving you to go your own way? Or is this just the best work someone like you can get in a town like this (if you're a half-elf or half-orc, a commoner in a town with a heavy noble family presence, etc.)? Most importantly, though, ask where your from. What place do you call home, and how has it molded you? Whose streets have you wandered, and what mark have they left on your speech, your habits, and the company you keep? Because while we often think of the wilderness when we head out on adventures, but noir heroes tend to call the stone canyons of big cities home. Doesn't mean they can't leave, or that they don't know what to do once they're in the rough, but they're most definitely an urban class of bruiser. That's all for this week's Unusual Character Concepts. If you've played a character like this, feel free to tell us about it in the comments. For more of my work, check out my Vocal page (or just go straight to my Gamers archive). Alternatively, go check out the YouTube channel Dungeon Keeper Radio, where I help out from time to time. To stay on top of all my releases, follow me on Facebook, Tumblr, and Twitter. Lastly, if you'd like to help support me, then Buy Me A Ko-Fi to leave a one-time tip, or go to The Literary Mercenary's Patreon page if you want to become a monthly patron. Either way, free stuff and my thanks will both be yours!